The explosion – detailed in a study published in Nature Astronomy – occurred 2.4 billion years ago, but the enormous distance that light from the event had to travel to reach Earth meant it wasn’t observed by astronomers until 2010. The slow evolution of the explosion allowed scientists to monitor it for several years. Dr Cosimo Inserra, of the University of Southampton, was involved in the analysis of data and helped identify the only two possible scenarios that could explain the event. 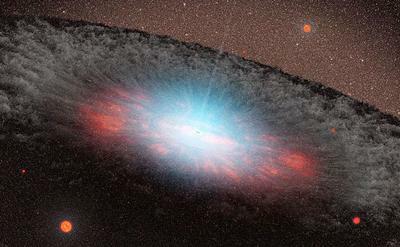 He also tested the data using established physical supernova models to support the results. He commented: “The discovery we made has revealed explosions capable of releasing an amount of energy ten times bigger than normal explosions. “Our data show that events like this are not very unusual and challenge our knowledge of exploding and disrupting stars. The international team included research institutes from Finland, Sweden, Ireland, Italy, Spain, Chile, and the US.